Apparently, the great stash redistribution project Fair Isle box had quite a ride getting to me. It took around four days to travel an hour and a half. But, that’s not the important part. The important part is that it arrived and man was it a treat! There are so many goodies in that box. I won’t list them all because I don’t want to ruin the surprise for those in the Dallas area where the box is heading. But I will tell you what I selected and what I put in. I added four skeins of Cotton Fleece. I had ordered enough for a sweater but when it arrived it was two different dyelots. I’m using half of it for the ribby shell and the other half will find a new home. I also added three skeins of grape Country Classic, the yarn I used for Grover. It would make a great felted bag or maybe a scarf, but I don’t think I’ll ever actually use it. I also added a set of size 2 dpns. I haven’t used them yet, and don’t think I probably will. Now, on to what I chose out of the box. It was a hard decision but it was a lot of fun, like shopping in a free store! Here is my haul. I picked the Cleo Plus egyptian cotton by Plymouth yarns. It is a really cool yarn because it has these little flecks of color. I also found six circular needles: two size 2’s, two size 3’s and two size 5’s. I’m hoping to use these to utilize my new knitting trick of knitting with two circular needles. I think the 2’s and 3’s will be great for socks and the 5’s are going to be used for hats. Also, I may be able to use one of the size 5’s for my flower washcloths. They call for 6’s, but we’ll see once I swatch. In addition to the GSRP box, I also received goodies from Threadbear this week. I already mentioned the ball roller. I also got yarn for two flower washcloths and for my second pair of socks. After Jen’s experience, I had to try some Painter’s Pallette. 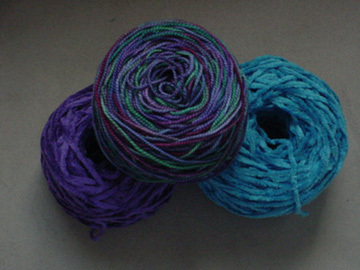 I actually have two skeins of the koigu, but have only wound one. It was a fun arrival because I asked Rob to just pick a colorway with purple in it. The colorway he picked is beautiful! I finished my first pair of socks this weekend! They are by no means perfect, but I love them and they have taught me a lot. 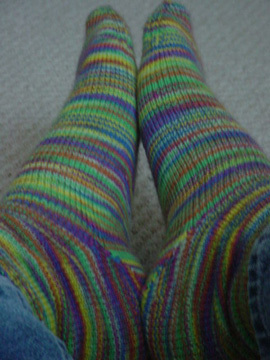 I used the figure 8 cast-on and Wendy’s toe-up sock pattern. I have determined that I think I want the cast-on to be a bit wider. My feet are big. I also got better at the cast-on for the second sock, which was good. I’ve been wearing them since I finished the last one and they are really comfortable and feel totally different from any sock I’ve ever worn. I’m definitely hooked. Oh, and here they are. You, my girl are in a knitting frenzy. Socks, cami, hats, washcloths…you just amaze me. I’m Pamela in Dallas, I’ll be receiving the GSRP box next! I’m so excited and although I’m a little disappointed by you not saying anything, thanks for letting me be surprised! 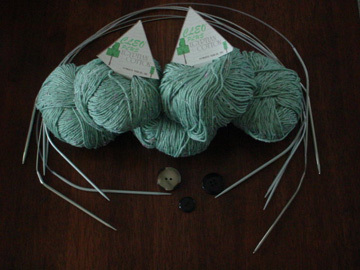 Enjoy your new yarn and needles! Go chica go!! Your needles will be smokin’ with all the projects coming off ’em!! I’m happy to say I’m back home in Texas – yeehaw!! The picture of your new Koigu PP yarn for socks looks like the color I just finished. It knits up into a wonderful sock, and the color was a pleasure all the way through. Enjoy. Ooooh, girl! I’m so jealous of your new yarn and your new circular needles! I think I’m also on the Fair Isle Box list, but I think I’m second to last. 😦 Have fun with that Koigu. You’re gonna Looooooove it. Wow, nice stash! You do have a lot of knitting ahead of you…but with fabby yarn like that, it’s really really exciting! I’m in Dallas/Plano, but I’m on the 2nd round list. 😦 Can’t wait til the box makes its way back around. I have way more yarn than is healthy for a body! I also have books to contribute. Hope the stash is as exciting as yours when it makes it back to us Texans again! Knit on, chicks!